Well you’ve got to love the Great British Summer… Insane, heatwave for weeks, then the weekend you’re scheduled to spend on the bike, it pours down something chronic! 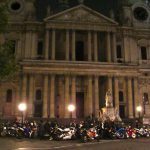 Is My Bike Affected by London Emissions Charges? 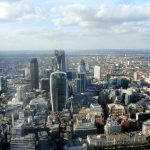 If you live or commute into London, you will undoubtedly have heard about a raft of emission charges, toxicity charges or ultra low emission zone charges being banded about to tackle pollution. With so many charges, consultations and plans a foot it’s tough to get a grip of what the hell is actually coming into affect and how it’ll affect you and your bike. 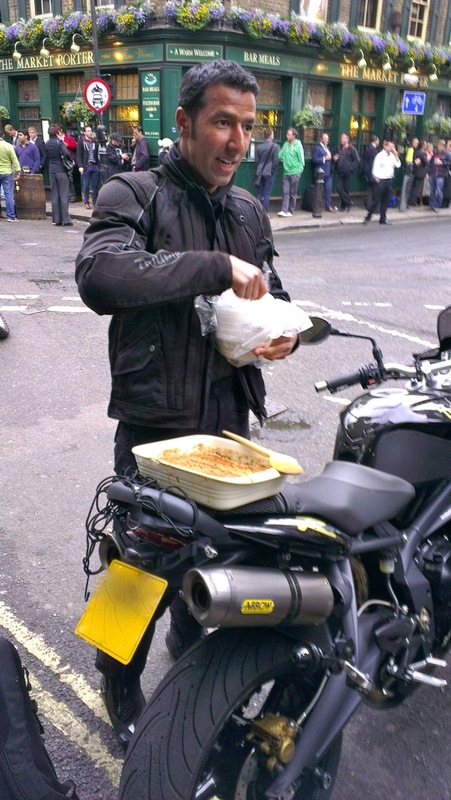 Pollution is pretty bad in London, but motorcycles should definitely be considered as part of the solution. Bikes rarely, if ever sit still in traffic jams and have much shorter journey times and thus pollute less. Recent TFL consultations even concluded bikes contribute less than 1% of nitrogen oxide (NOx) emissions. So read on to learn how to avoid the charges and keep biking. Most of the time when on a motorcycle in London you are immune to commuting delays, as you can filter past pretty much anything. However on this day, my commute was delayed by a cruise ship. Bummer. Here we are at Tower Bridge, waiting for this large Cruise ship to undock from HMS Belfast and make it’s way down the Thames. No matter how hard I tried I couldn’t quite filter past this one. 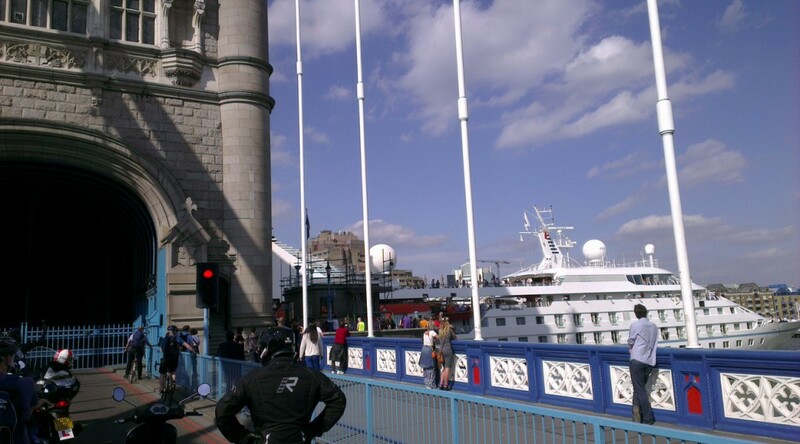 Still, it was a nice day to take stock of the fact I ride past some great icons of British architecture everyday. What iconic landmarks do you commute past on your way to/from work? 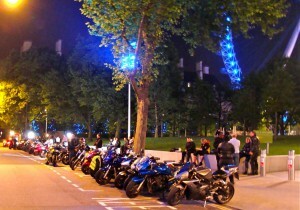 The other night The London Bikers organised a night to remember, a midnight ride ride across the city hooning past all the sights. What made it special was the immense turnout (over 50 bikers), the gorgeous warm evening and amazing atmosphere from fellow bikers and the crowds spectating and cheering us all on. With Miss Plum getting everyone organised and leading the ride, we all had a top night we’ll always remember. 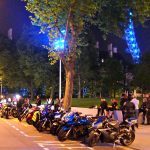 Our ride started at Oval Motorcycle Centre, then on out across Battersea Bridge into Chelsea and Knightbridge, before whizzing past Wellington Arch, Buckingham Palace before a quick pit stop on the Mall overlook St James Park. Then on past Trafalgar Square and looping up round into Soho via Frith Street, before heading down past Downing Street, the Cenotaph, Big Ben and Westminster Abbey and across the river for a second stop by Waterloo and the London Eye. Back in the saddle we went North of the river again, zoomed past Aldwych and Royal Courts or Justice, down Fleet Street and our third stop outside St. Pauls cathedral, for a perfect photo opportunity. Off again, hanging a right by the Bank of England and South over London Bridge, past Southwalk cathedral, Borough Market, the Shard and then crossing the river again over Tower Bridge, lit up beautifully. … a stop at the wonderful 24 hour Beigel shops for some much needed sustenance and a mix with Shoreditch hipsters leaving their night clubs and bars. 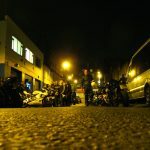 We continued North weaving through the streets and up to Brick Lane and a stop at the wonderful 24 hour Beigel shops for some much needed sustenance and a mix with Shoreditch hipsters leaving their night clubs and bars. To finish off, we continued East onto the Isle of Dogs and took a tour through the ghostly skyscrapers of Canary Wharf all lit up and towering overhead. The original plan was to continue on to Greenwich, but alas the Blackwall tunnel was shut for maintenance. 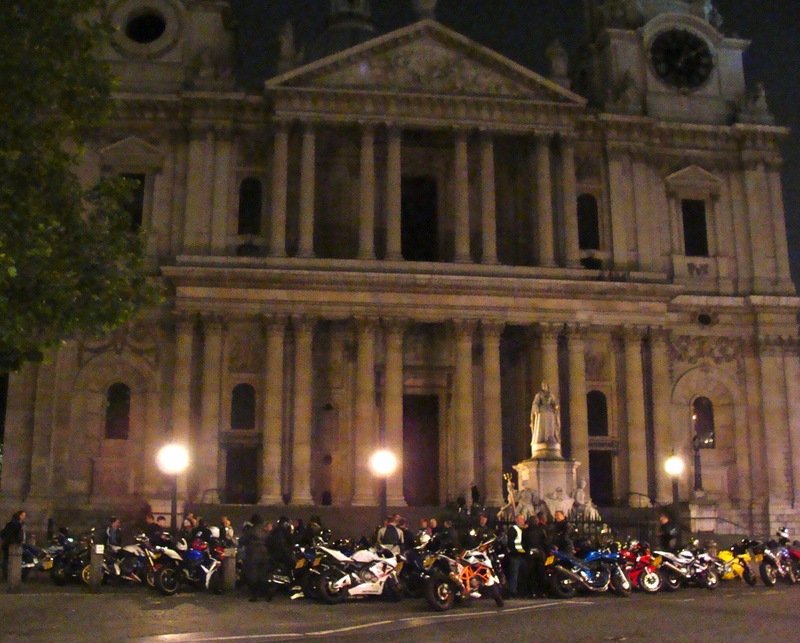 All in all, it was a wicked night, it was great to get out with Mary pillion (sorely missing a bike of her own) and great to see all of London’s landmarks lit up. Everything went swimmingly, even if group of us sometimes got separated momentarily. 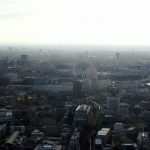 Not really motorcycle related, but definitely London related; here’s some snaps from a recent mini adventure I had up to the top of the London Shard to check out the view across London. Thankfully, the weather was top notch and the view stunning. 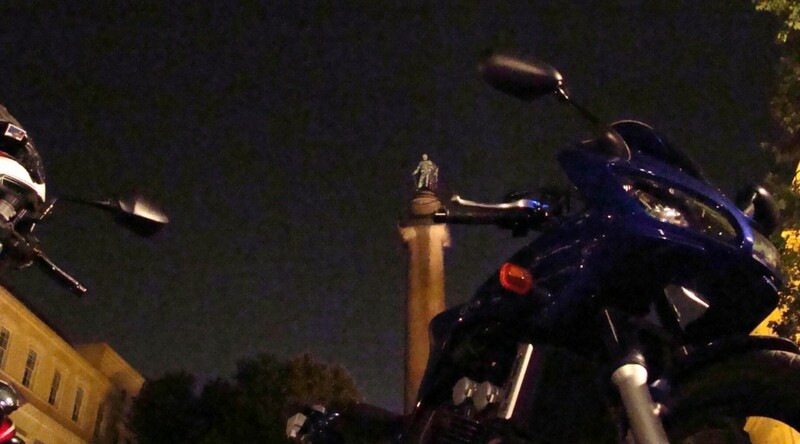 Could pinpoint landmarks for miles around. Tickets aren’t cheap at £25 a pop, but you won’t get a view like this anywhere else. Definitely worth checking out if you’re in town. 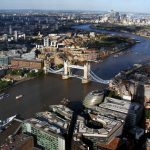 HMS Belfast, Tower of London, Tower Bridge, Docklands. London Shard from the ground. 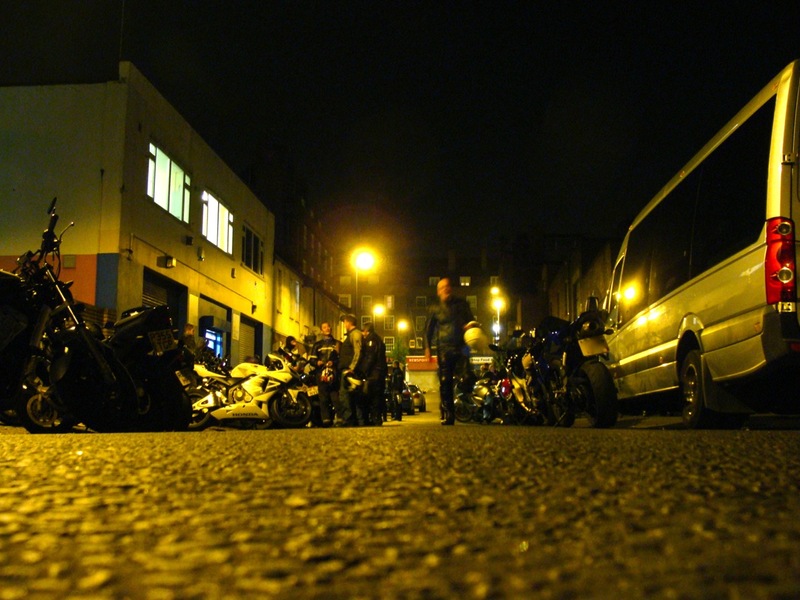 Another Wednesday night, another London Biker meet up at Borough Market. Traditionally home to some of the best food produce, organic fruit, veggies, quality meat, game, hand cooked meals and deserts. So, of course not to be out done, Thamer arrives with a home baked apple crumble strapped to the back of his Street Triple. And why not?! A little quiet on attendance (bah! you other fair weather bikers! ), but we all had a good chin wag and tucked into some tasty pudding. But what culinary delights can other bring next week? 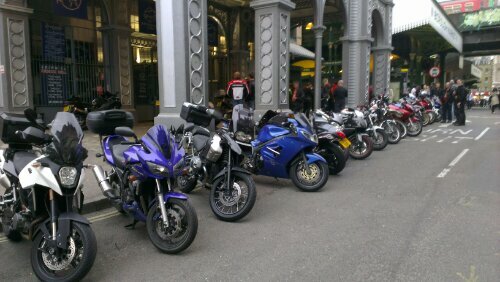 Just back from a good meet up at Borough Market with the London Biker forum bunch. 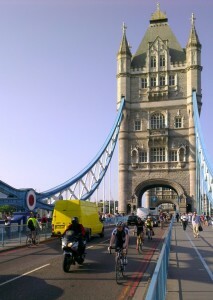 Great turn out, lots of bikes (only half in photo above), of all shapes, sizes and ages. 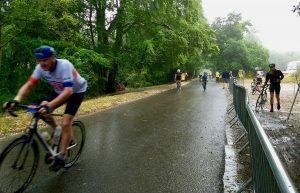 Good friendly banter, but cut a little short due to rain. Can’t believe I’ve not made it before as I only work 5 mins around corner. Distinctly frosty and foggy this morning. But once wrapped up warm, it was a good ride into work. So glad I’ve got my heated gloves and Pinlock visor. I do like riding into London on a foggy day, coming in past Canary Wharf, with just a sun blinding glint coming out of the fog where some skyscraper is hidden. 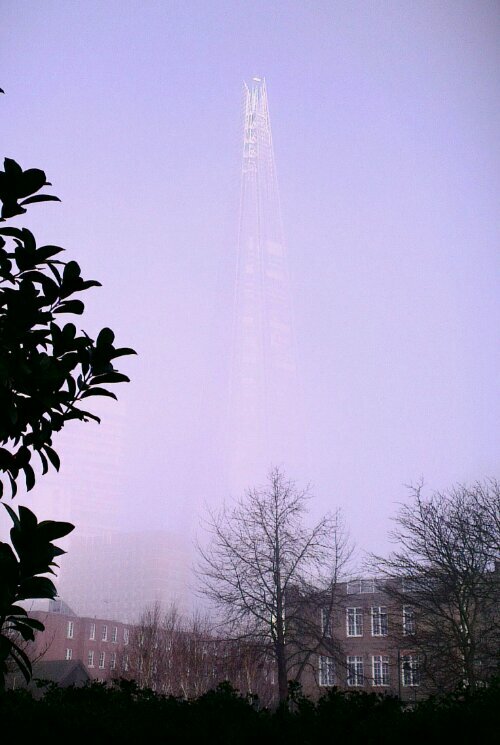 The Shard (pictured) was particularly dazzling as it poked out above the fog, and just the top most floors visible and catching the sun. 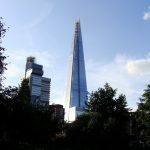 This shot of the Shard was taken from just off Bermondsey Street.